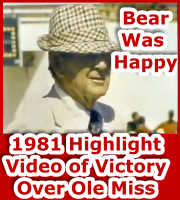 Alabama trounced Ole Miss in 1981 with Bear Bryant leading the Tide to a 38-7 victory. The footage shows Jeremiah Castille intercepting a pass and making a nice run. You will also see Walter Lewis get into the game and play a good bit in one of the earlier games in his career at Alabama . Video features announcer Bill Flemming, who was one of the original announcers of ABC's Wide World of Sports. Do you see a win like this today? Or even worse? I predict a near 50 point spread in an Alabama victory today.